The complete skeleton of an 8-meter-long dinosaur has been unearthed from marine deposits dating back 72 million years at Japan's northern island of Hokkaido, making it the largest dinosaur skeleton ever found in Japan, according to researchers. Excavations to uncover a fossilized duck-billed dinosaur (Hadrosauridae) in the Hobetsu district of Mukawa Town have been underway since 2013. 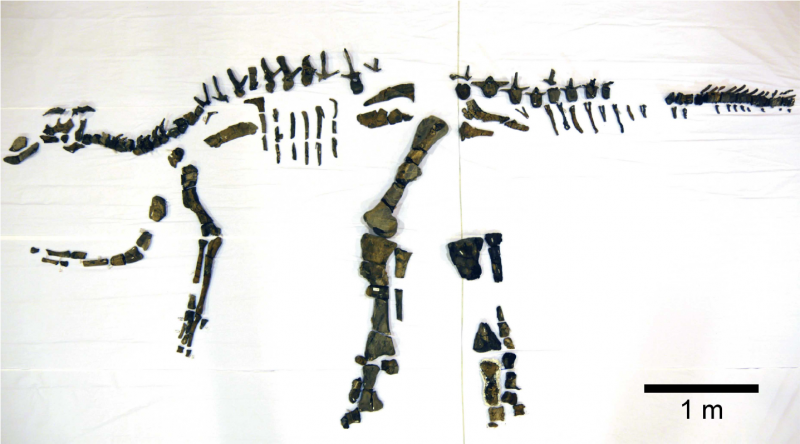 It is the third time a complete skeleton of a Hadrosaurid from a marine stratum has ever been discovered, according to the research team from Hokkaido University and Hobetsu Museum in Mukawa. Hadrosaurids, or duck-billed dinosaurs, were common herbivores during the Late Cretaceous Period (about 100 million to 66 million years ago) and thrived on the Eurasian, North and South American continents as well as at Antarctica. Complete hadrosaur skeletons have been unearthed on these continents, but it is extremely rare for a complete skeleton of a land dinosaur to be discovered in a marine stratum. In 1936, a complete hadrosaur skeleton was unearthed from a marine stratum in Sakhalin and named Nipponosaurus by Professor Takumi Nagao of Hokkaido Imperial University (predecessor of Hokkaido University). It had been the only such fossilized dinosaur from a marine stratum that was assigned a name. The latest discovery of the fossilized skeleton, nicknamed "Mukawaryu" (Mukawa dragon), represents the third such discovery in the world, including a complete skeleton of an undescribed specimen. If a complete skeleton is defined as a skeleton containing more than 50 percent of the bones, Mukawaryu represents the second complete dinosaur skeleton unearthed in Japan after Fukuivenator, a 2.5-meter carnivore from the Early Cretaceous Period (about 145 million to 100 million years ago) discovered in Katsuyama City, Fukui Prefecture. Mukawaryu is the first complete skeleton of a herbivore from the Late Cretaceous Period and from a marine stratum in Japan. Dr. Yoshitsugu Kobayashi of the research team said "We first discovered a part of the fossilized Mukawaryu skeleton in 2013, and after a series of excavations, we believe we have cleaned more than half of the bones the dinosaur had, making it clear that it is a complete skeleton." There are more than 50 kinds of dinosaurs in the hadrosaurid dinosaurs, which is grouped into two groups: uncrested (Hadrosaurinae) and crested members (Lambeosaurinae). "Although Mukawaryu has some characteristics of both groups, our preliminary analysis indicated it might belong to the Hadrosaurinae. Further cleaning of the fossils and detailed research should make it clearer which group the Mukawaryu skeleton belongs to," says Kobayashi.